Young Nep lower leaf die off. Help please. Thread: Young Nep lower leaf die off. Help please. How can you tell the difference at this size? 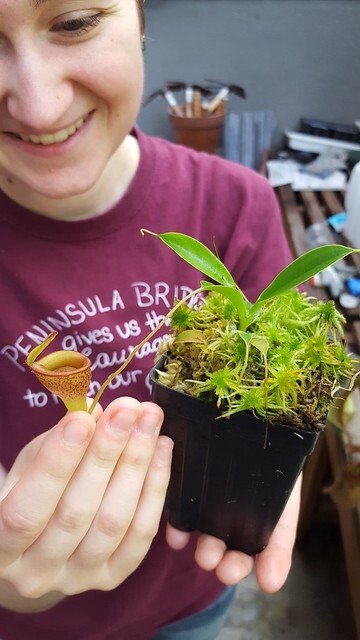 Leaf shape/pitcher? Here are a few up close shots. Can you point out the features that leed you believe N. Dubia? 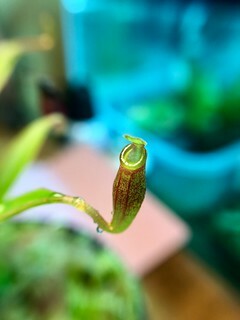 N. dubia and inermis both possess red stems and a compact, erect growth form that jamban doesn't have, as well as young pitchers with a broadly infundibular lower half and more constricted, sometimes semi-flattened but often cylindrical upper half as well as a heavily slanted pitcher mouth, and they're produced on rather short tendrils so the pitchers "float" just off the leaf tip. 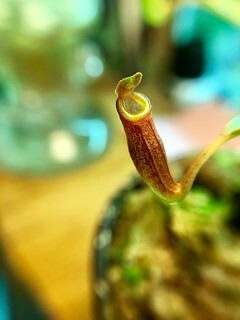 N. jamban, even from a young age, has more slender leaves, no red stem, and pitchers from very early on are narrow in the base and broad above with a wide mouth that stays more horizontal. Thank you for the reply. Always Interested in learning something new. 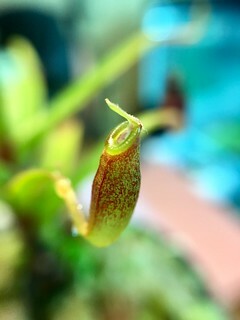 Jamban leaf shape (even at that size) has a bit more tear shape to it and the tendrils are much longer. Also the pitchers exhibit the "toilet" shape pretty early on, and the peristomes are a bit wider/exposed. Dubia, in contrast, exhibits a smaller peristome to pitcher body ratio. Below is a picture with my Jamban at a similar small size. 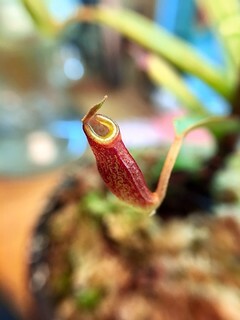 Note the leaf shape and pitcher morphology. This plant may be a little older than yours, but it is still very different. Thank you. It's a shame as I wanted a Jamban really bad. Thanks for the tip. Plants are going to have to wait for now. Life is not being nice. Do cuttings and leaf pulls have a lower success when done in autumn. By leeslikkers in forum Introduce Yourself! Too warm? How to lower it?